Not long after its launch in India, this handset will reach Bangladesh, Nepal, and Sri Lanka, followed by no less than 11 European countries. 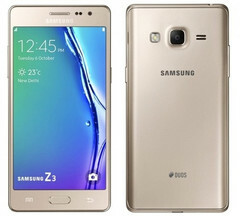 Samsung Z3 is the company's second Tizen smartphone and has been recently released in India. Although its specs are much better than those of its predecessor, the Z3 is still far from an average mid-ranger. However, it looks like a 4G LTE-capable variant will soon be available, and the handset is already being tested in Europe. Tizen Experts reports that their inside sources revealed no less than 11 European countries will receive the Samsung Z3 after it reaches Bangladesh, Nepal, and Sri Lanka. According to these insiders, the list of countries that will get the Tizen handset in Europe consists of the following countries: UK, France, Germany, Ireland, Italy, Poland, Russia, Ukraine, Lithuania, Latvia, and Kazakhstan (strange enough, because this country is located entirely in Asia). There is no info regarding launch dates, so we can only hope the Z3 will reach Europe in time for the holiday shopping season. If priced accordingly, it may help Tizen become a relevant mobile operating system in the region.